A North American porcupine may have as many as 30,000 quills used for defending against predators. 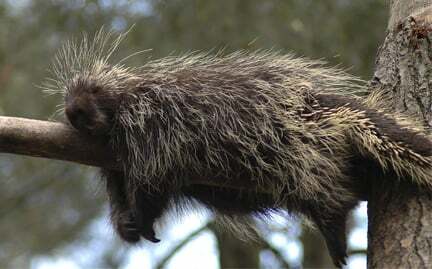 Porcupines make their dens in holes in trees or in rocky areas. They will often continually feed on the same tree, causing extensive damage that kills the tree. Females usually give birth to a single offspring after an especially long gestation period. Typical defense behavior involves backing up to a predator and swinging the tail to release a high concentration of quills.